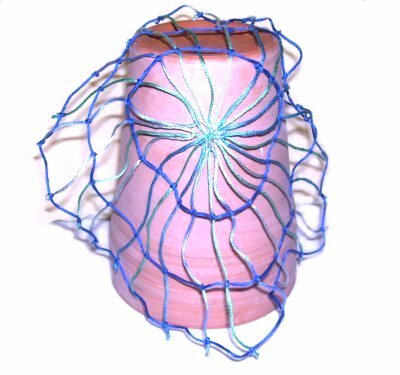 Description: This Spider Web is a fun Halloween project for school age kids and beginners, since there are very few knots used in the overall design. Young children may need help with the knots. 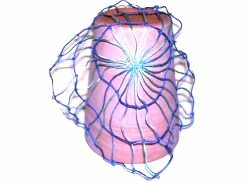 This decoration is very flexible, so it can be hung on a wall or draped over furniture. 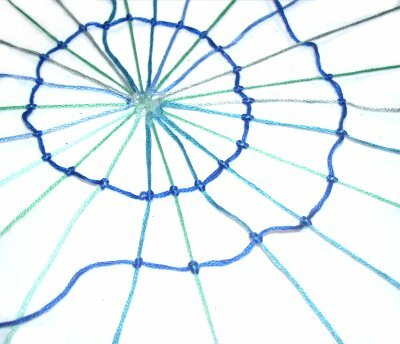 Make it with soft, delicate material such as the cotton embroidery cord used in the example. 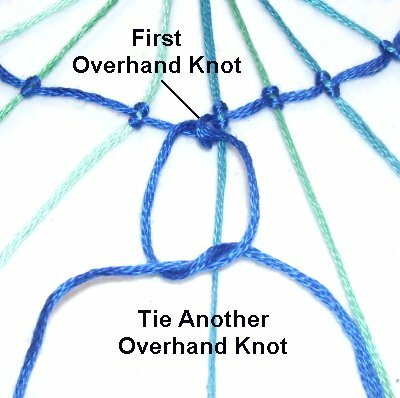 You should practice the knots a few times before making this Macrame pattern. Step 1: Cut 12 cords, each at least 25 inches long. The longer you cut the cords, the larger you will be able to make the Spider Web. Prepare the ends with glue or tie Overhand knots at the tips. Step 2: Fold the cords to locate the center. When you position them in the next step, the center of each cord should be matched up (see image below). Secure them to your project board where they all meet in the center. 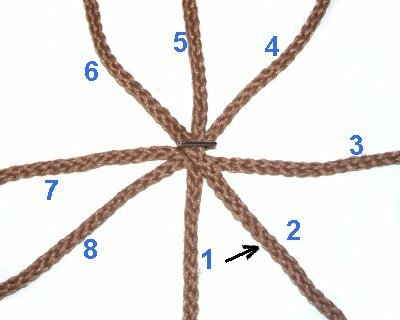 The new Crown Knot page has more details, if you need a review of the steps. 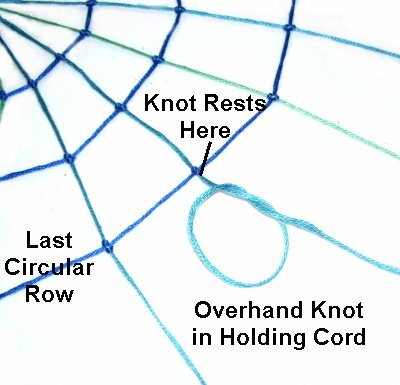 One cord for your Spider Web should be vertical, the next horizontal, and the third and fourth diagonal, forming an X. Mentally number the cords 1 - 8, starting with the one in the center at the bottom. Step 3: Curve each cord over the next, starting with cord 1. Move counter-clockwise. 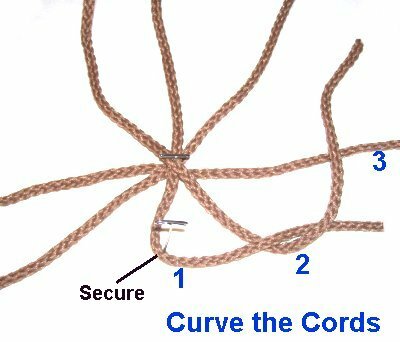 Mark the curved area of cord 1 with a pin, so you can find it easily. Step 4: Tighten the Crown knot slowly by pulling on each end. It will be in the center of the Spider Web, so tighten it completely. Secure each of these primary cords to your board separately, and secure the Lanyard knot, too. Step 5: Secure a new cord under one of the primary cords, matching the ends so the new cord is centered and arranged horizontally. 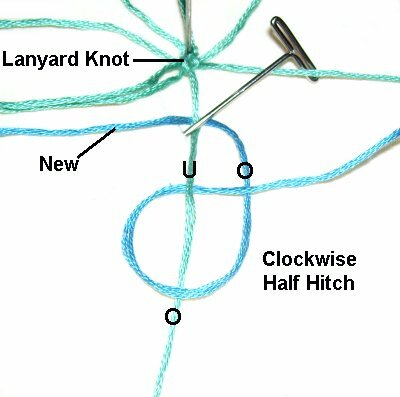 Use the right half of the new cord to tie a Half Hitch onto the primary cord, by making a clockwise loop. Pass over - under - over as shown. 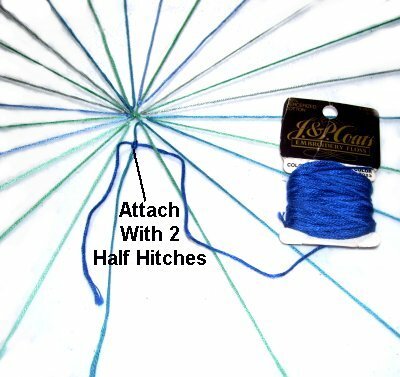 Tie a second Half Hitch, while holding the first one steady. 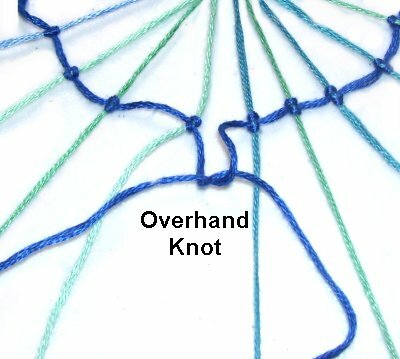 Tighten the knot as much as you can, after you push it up against the Crown knot (arrow). Repeat this process, adding new cords to each of the remaining primary cords. Fan out all the cords, arranged in a circle. Secure each one with a pin, or with tape. They need to be straight, but should not be pulled tight. 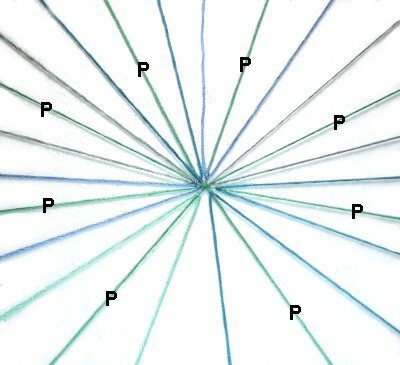 In this image, the primary cords used to tie the Crown knot are labeled (P). The added cords are on either side of them, with two between each primary. Each of these cords is a holding cord from now on. Step 6: The working cord used to form the circular rows for the Spider Web should come directly from the roll. You will only cut the material after the row is done. Wrapping a generous length of material on a piece of cardboard really helps. Attach the end to one of the holding cords, with two Half Hitches (as you did when you added the new ones). Leave a 3-inch tail. Position the knot so it's between 1/2-inch and 1-inch below the knot you tied in step 5. Important: Don't rely on the tape or pins to hold the cords when tightening each of the knots. Support the holding cord as you tighten each knot firmly. The best way is to pinch it between your fingers. Try pressing it firmly to the surface of your board if that's too awkward. 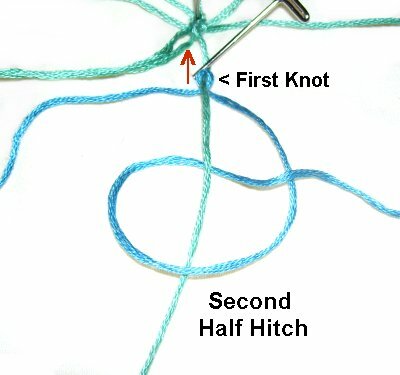 Pass the working cord under the next holding cord, and then tie another knot (2 Half Hitches). 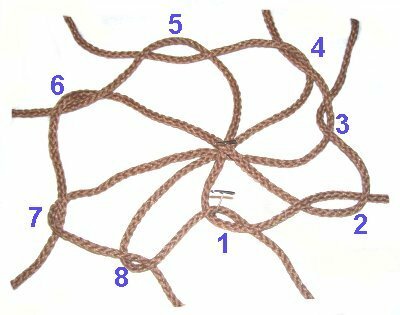 Repeat this process, tying one knot onto each holding cord, working in a circle. 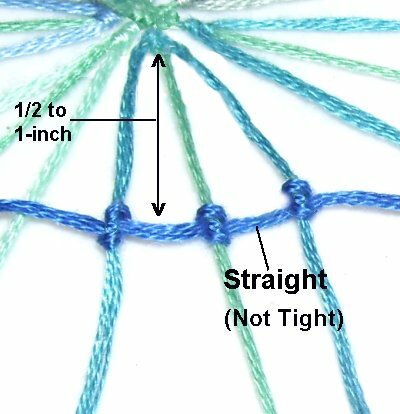 Try to keep the area between the knots straight, but not tight. Step 7: When the circle is complete, cut the material, so you have another 3-inch tail. Tie the two tails together with an Overhand knot. Tie a second Overhand knot, tightening it as much as possible. Cut off the extra material, after applying glue to the knot. Step 8: Repeat steps 6 and 7, tying several more rows. The spacing between the rows is up to you, but 1/2 inch to 1-inch is recommended. Important: You can make as many rows as you wish, but make sure you stop when the rows get close to the end of the holding cords. The holding cords need to have at least 4 inches free for the final knots. Step 9: When the last circular row of the Spider Web is done, it's time for the finishing touches. Remove the pins or tape from one holding cord, and tie an Overhand knot. It should be tightened so it rests next to the DHH in the last circular row. Apply glue, and cut off any extra material. Repeat this process with the remaining holding cords. Have any comments about the Spider Web? Contact Me.